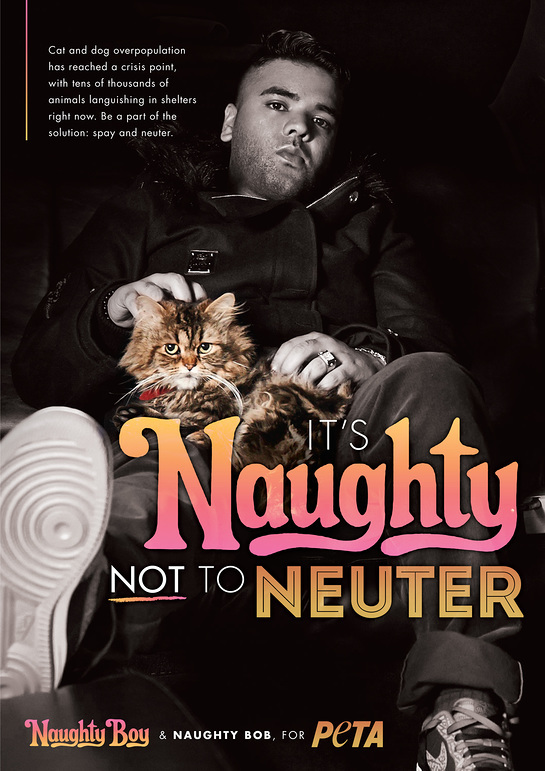 Why are Naughty Boy and PETA so fixated on getting animals fixed? One unspayed female cat and her offspring can produce 370,000 cats in just seven years, and an unneutered male can help create limitless litters of kittens. Every year in the UK, many thousands of unwanted animals are left at crowded animal shelters, where many must be put to death. The less fortunate ones will never make it to a shelter – they will be forced to fend for themselves in all weather extremes, lose battles with traffic and disease and have no constant food source. Fixing cats and dogs is also an easy way to ensure healthier, happier animals. Spaying females eliminates stressful heat periods and the risk of developing uterine infections, and it greatly reduces the risk of developing mammary cancer. Neutering makes males far less likely to roam or fight and prevents testicular cancer. Naughty Boy, also known as Shahid Khan, has worked with numerous musicians, including Chipmunk, Wiley, Leona Lewis, Jennifer Hudson, Cheryl Cole and Emeli Sandé. Hotel Cabana is his debut album, and its first single, “La La La,” featuring Sam Smith, reached the top of the UK’s music charts. Naughty Boy joins a growing list of musicians and producers – including Jay Sean, Waka Flocka Flame, Mark Ronson, Simon Cowell, Joss Stone, Paul McCartney and Morrissey – who have teamed up with PETA to promote kindness to animals.